From the time we picked up our keys to the time we dropped them off 4 weeks later, we felt right at home. Shangri-Lala has an open floor-plan with bedrooms at either end, so there is plenty of living space. The kitchen was easy to work in with the latest appliances - beautiful. The community was very friendly and welcoming. This charming 2/2 condo is located in a great area. Easy access to beach, restaurants. We had 4 adults and 2 kids and it was a perfect fit for all. 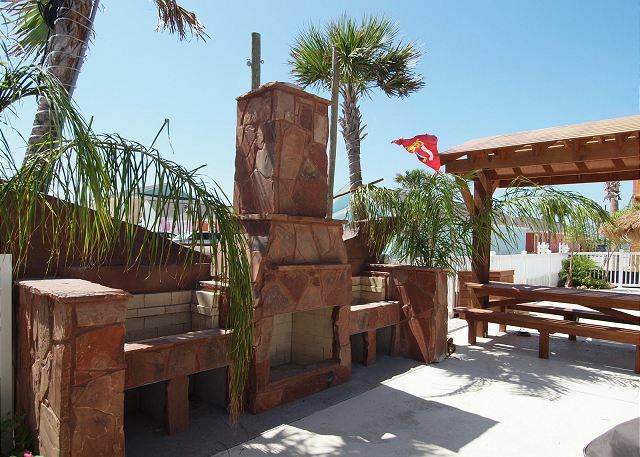 The condo has 2 pools and grilling areas which made it nice to alternate purse days between the beach and pool. The condo is setup with a. Ice kitchen but I do recommend you bring grilling supplies and your must haves in the kitchen as it's not well equipped in that area. Other than that our vacation was great and we will be back! We had a great time, the condo was very nice and close to everything important, like the liquor stores and beach! The pool area was very nice and well maintained. The staff at Port A Escapes was wonderful and let us check out late without question. We will return again this summer. The rental was clean and comfortable. This is second time we have stayed here. Pool was clean. The decor is a little dated and one of the outside lights on the fan didn't work, but who cares! It's not within walking distance to the beach, but it's a very short drive to get there. Best part, no stairs! This was our first time staying at Pirate's Bay. We were really pleased with everything, the condo, the pools, etc. The location worked too. I would definitely return and would recommend it to friends. 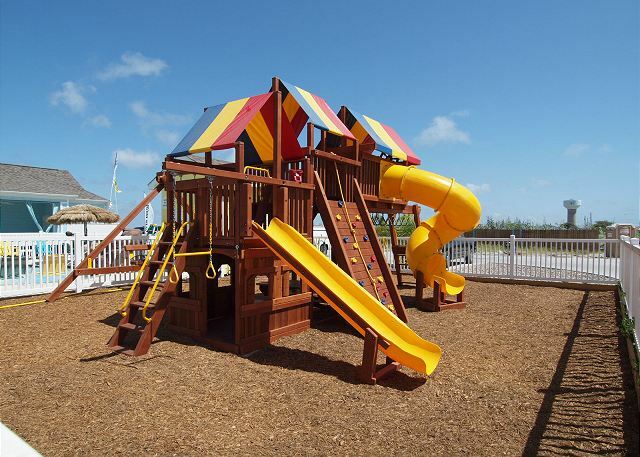 We are glad to hear you enjoyed your Labor Day Weekend at Pirates Bay. Whenever you are ready to comeback, just give us a call next time your in Port A. So cute! We loved the layout and the decor. The area it is in suites us well. Super easy check in and check out. THE SHANGRI-LALA PB121 WAS FABULOUS!!! THE DECOR AND AMENITIES WERE OUTLANDISH. THE ONLY THING I WOULD SUGGEST IS TO GET A HAIR DRYER- AND SMALL GRILL FOR THE PATIO...AND THE WIFI DIDNT WORK SO UPGRADE CONNECTIONS.MERCI BEAUCOUP!!!!!!! Great place to stay for a quick trip - only negative was that we didn't have great directions on how to get to the actual unit, but a quick phone call took care of that. They were also quick to fix a broken garbage disposer. We had a great time and will go back again. After checking in at Beach Head number 105 and finding the place outdated and dirty - we didn't even want to walk bear feet on the stained/grungy carpet. We were put in this lovely clean new rental. Condo was clean, beds were real comfortable, close to everything especially beach. Pool was fun for kids. And best thing was being able to have my dog there. She enjoyed the cold stained concrete floor. Liked how rooms and baths were on opposite ends. Patio area was wonderful and was nice to have a door from master to go out on patio or leave from bedroom without waking others. We would go back again for sure. Loved this condo! It was perfect for our family of four. Beautiful and very clean! The whole process of renting this place was a breeze. Picked up keys, went in and made ourselves at home. We loved that we could bring our dog with us. There are two pools to enjoy, although after all the heat waves they were a little too warm to cool off. Kitchen had everything we needed to cook for our family. Everything was clean and in great shape. Thanks! We would definitely stay here again! The condo was clean and decorated in a fun beach motif. We were surprised to see that the outside seating area all belonged to this unit and has gates on either end to give you complete privacy. We, especially, loved the fact that the unit was only two doors down from the smaller pool and was pet friendly. I will say that Pirates Bay could really use a little more grass for the number of dogs there. Also, we never did figure out the internet here. A password would have been nice to have included in our information. Overall,I would definitely recommend this property. Our family has been going to Port A for the past eight years. This was our first time to stay at Pirates Bay. And, we absolutely loved our condo, Shangri-LaLa!!!! It was clean, well furnished, and spacious. The kids loved the pool and the fact our condo was close to the pool. The well manicured and tropical landscaping on the walk-ways created a very relaxing and peaceful environment. Originally booked because it was one of the few places I could find that didn't require 3 night stay. Other than being a little firther from town center than what I would have preferred, it turned out to be an excellent choice. Exceptionally clean, two master bedroom design great for two couples, parking right outside door, well furnished, all appliances worked. The only small issue I had was that we could not find the code for the wireless modem, which appeared to be on and working. We had a wonderful time and enjoyed the amenities. Very comfortable. Clean, quiet, well appointed condo. Great location, nice pools. Prefered this condo to several beachfront units I have stayed at in the past. Great condo with wonderful amenities! Spacious and clean condo that felt like home. The pools and Playscape were awesome! I loved the dog friendly atmosphere!! Very convenient walkable 24 hour store nearby. Three great months in this lovely property and beach town!!! The condo was great. The layout and the rooms were very nice. We brought our dogs and the little patio was good for letting them out now and then. The kitchen had everything except a hand mixer. There was no blow dryer in the bathroom. The only problem was that the beds were so soft I kept sinking and rolling into the middle. Good location but you have to drive to the beach. Great place to just hang for a few days. Very nice place, clean & relaxing. The pool was within steps from the condo. The landscaping was beautiful. Overall...would definitely stay here again! Charming, very tastefully decorated, clean. All the amenities of home. Loved the property and loved the pool. We would like to see a grill for the cottage next time. We had a good experience with this condo. It's close to the pool and very comfortably furnished. The condo was clean and well appointed. It worked well for our family needs and the two pools provided good variety. We enjoyed the location being very close to the main restaurants and also to the beach entrance. The condo had most items to feel homey. The A/C was not working when we arrived, but management had a repair crew there immediately after calling and it was fixed very quickly, so kudos to the management. A couple of items that were not perfect included an old coffee maker that barely worked and the TV in the living area was outdated and did not have a good picture. Overall a nice stay, but a couple of items need updating. This is the second time that we have stayed here and I love this place. It is different from what you think of when you think of a condo. It is one floor and a group of condos very close together. But it works. There is a little fenced in area between each building where you can grill and the kids can play safely. There is a pool for all of the residents to share. The condo is beautiful, nicely decorated, very clean and has all of the extras. It is also huge. You can go into your bedroom if you want some privacy. It is close to everything including the beach. The only problem that we had was the shower handle in one of the bedrooms broke. This happened during both stays. However, I would recommend this place to everyone. The home was nice - good layout, clean, cute. Need to put some hooks in the bathrooms for towels. Nice little private patio. The community is super cute with nice pools. Our shower did not work but they sent a plumber out as soon as I called and he was able to fix it. I loved Port A and would definitely recommend it over Corpus - very touristy with all dining and shopping conveniently close. Great vacation rental for a family. It was a lovely cozy place that provided everything we need. The single story split bedroom floor plan is ideal for a family. 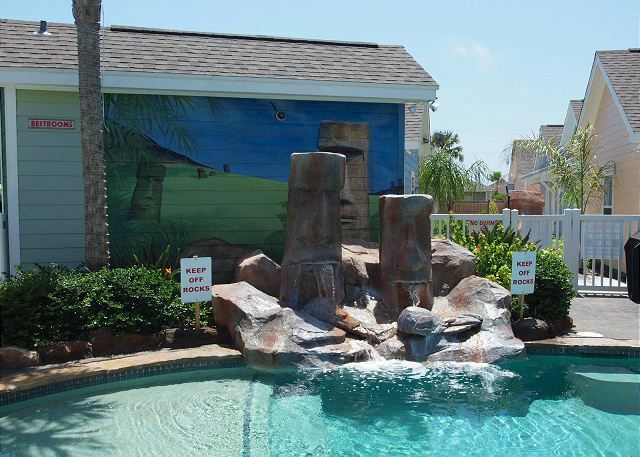 We enjoyed our stay here at Pirates Bay and loved the amenities. The location is close to the beach and the convince store/gas station. This place was amazing!!! So much space very clean and well kept...the pool was so relaxing..a perfect place for kids husband and I plan on coming back next year!!! We had a fabulous time! Condo was excellent and clean. Staff were very helpful! We will be back again (hopefully in a month)! The house was very nice. It was just me and my fiancé staying at the house so there was plenty of room. 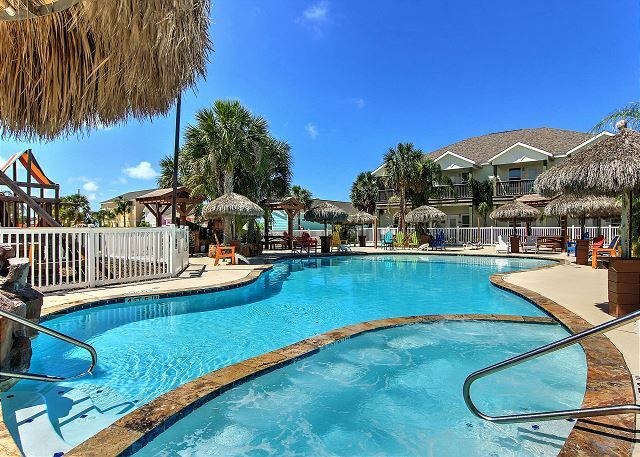 The Pirates Bay Resort is a great place to stay in Port A. The beach is 5 minutes away on a golf cart. 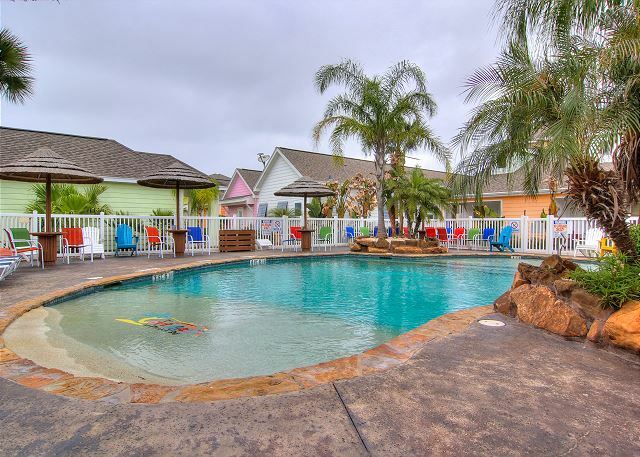 We don't have kids but Pirates Bay is very kid friendly with 2 onsite pools. The house was very comfortable and had a private lounge area to enjoy your coffee or late night drinks. We had one small plumbing issue with the master shower. Made a phone call to Port A Escapes and they had a plumber over there within the hour to fix the issue. Also the living room TV is outdated, dvd player does not work, and the master does not have a TV. Those are my only complaints. We had a fantastic time in Port A and would definitely recommend the Shangri-Lala house. Can't wait to go back next summer.